The temple complex spread over 50 acres in the heart of the city. It is an ancient and historic temple dedicated to Lord Shiva Nataraja and Lord Govindaraja Perumal, one of the few temples where both the Shaivite and Vaishnavite deities are enshrined in one place.To the followers of Shaivism (Saivism) or the saivaite, the very word koil refers to Chidambaram. In the same way, to the followers of Vaishnavism it refers to Srirangam or Thiruvarangam. The word Chidambaram may be derived from chit, meaning "consciousness", and ambaram, meaning "sky" (from aakasam or aakayam); it refers to the chidaakasam, the sky of consciousness, which is the ultimate aim one should attain according to all the Vedas and scriptures.Another theory is that it is derived from chit + ambalam. Ambalam means a "stage" for performing arts. The chidakasam is the state of supreme bliss or aananda and Lord Natarajar is the symbolic representation of the supreme bliss or aananda natanam. 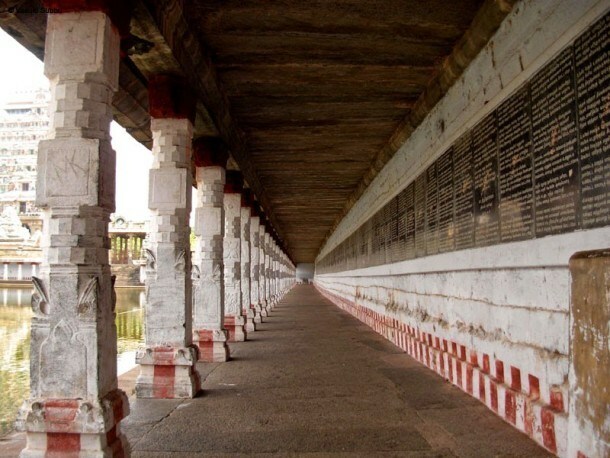 Saivaites believe that a visit to Chidambaram leads to liberation.Yet another theory is that it is derived from the word chitrambalam, from chithu meaning "play or dances of God" and ambalam meaning "stage”. A unique feature of this temple is the bejeweled image of Nataraja. It depicts the Lord Shiva as the Lord of the dance Bharatanatyam and is one of the few temples where Shiva is represented by an anthropomorphic murthi rather than the classic, anionic Lingam. The Cosmic Dance of Lord Nataraja symbolises the motion of the universe as sustained by Lord Shiva. 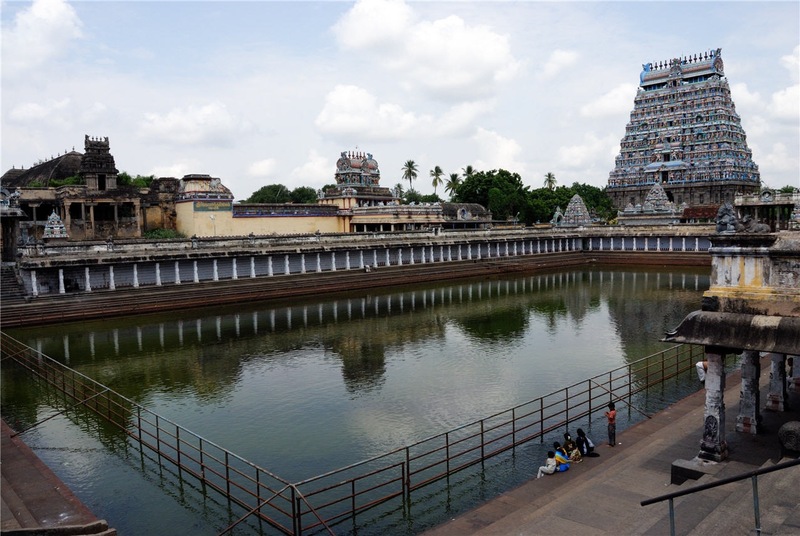 The temple has five courts.Aragalur Udaya Iraratevan Ponparappinan (alias Vanakovaraiyan) rebuilt the Siva temple at Chidambaram around 1213 AD. The same Bana Chief also built Tiruvannamalai temple.The temple has been traditionally administered by an endogamous group of shiavite brahmins called Dikshitar, who also officiate as its priest.The story of Chidambaram begins with the legend of Lord Shiva strolling into the Thillai Vanam (Vanam meaning forest and thillai trees - botanical name Exocoeria agallocha, a species of mangrove trees - which currently grows in the Pichavaram wetlands near Chidambaram. 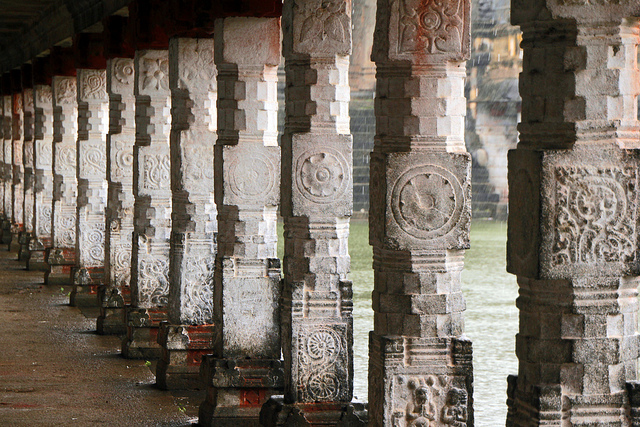 The temple sculptures depicting the Thillai trees date back to the 2nd century CE). In the Thillai forests resided a group of saints or 'rishis' who believed in the supremacy of magic and that God can be controlled by rituals and 'mantras' or magical words. The Lord strolls in the forest with resplendent beauty and brilliance, assuming the form of 'Pitchatanadar', a simple mendicant seeking alms. He is followed by his Grace and consort who is Lord Vishnu as Mohini. The rishis and their wives are enchanted by the brilliance and the beauty of the handsome mendicant and his consort.On seeing their womenfolk enchanted, the rishis get enraged and invoke scores of 'serpents' (Sanskrit: Nāga) by performing magical rituals. The Lord as the mendicant lifts the serpents and dons them as ornaments on his matted locks, neck and waist. Further enraged, the rishis invoke a fierce tiger, which the Lord skins and dons as a shawl around his waist.Thoroughly frustrated, the rishis gather all their spiritual strength and invoke a powerful demon Muyalakan - a symbol of complete arrogance and ignorance. The Lord wearing a gentle smile, steps on the demon's back, immobilizes him and performs the Ánanda Thaandava (the dance of eternal bliss) and discloses his true form. The rishis surrender, realizing that this Lord is the truth and he is beyond magic and rituals. Adhisesha, the serpent who serves as a bed for the Lord in his manifestation as Vishnu, hears about the Änanda thaandava and yearns to see and enjoy it. The Lord blesses him, beckons him to assume the saintly form of 'Patanjali' and sends him to the Thillai forest, informing him that he will display the dance in due course.Patanjali who meditated in the Himalayas during krita age joins another saint, Vyagrapathar / Pulikaalmuni (Vyagra / Puli meaning "Tiger" and patha / kaal meaning "feet" – referring to the story of how he sought and got the feet and eyesight of a tiger to help climb trees well before dawn to pick flowers for the Lord before the bees visit them). The story of sage Patanjali as well as his great student sage Upamanyu is narrated in both Vishnu Puranam as well as Siva Puranam. They move into the Thillai forest and worship Lord Shiva in the form of Shivalinga, a deity worshipped today as Thirumoolataneswarar (Thiru - sri, Moolatanam - primordial or in the nature of a foundation, Eswarar- the Lord). Legends say that Lord Shiva displayed his dance of bliss (the Aananda Thaandavam) - as Nataraja to these two saints on the day of the poosam star in the Tamil month of Thai (Jan – Feb). The Ananda Tandava posture of Lord Shiva is one of the famous postures recognized around the world by many. This celestial dancing posture tells us how a Bharathanatium Dancer should dance. The demon under Nataraja's feet signifies that ignorance is under his feet The Fire in this hand (power of destruction) means destroyer of evil the raised hand signifies that he is the savior of all life. The Ring at the back signifies the cosmos. The drum in his hand signifies the origin of Life. These are the main things that the Natarajar murti and the celestial dance posture depict. A rare type of thandava posture is seemed in Melakadambur temple nearby 32 km from here.In this Karakoil, Nataraja dancing on a bull and deva's rounds the structure it's a pala art being kept in this shrine. 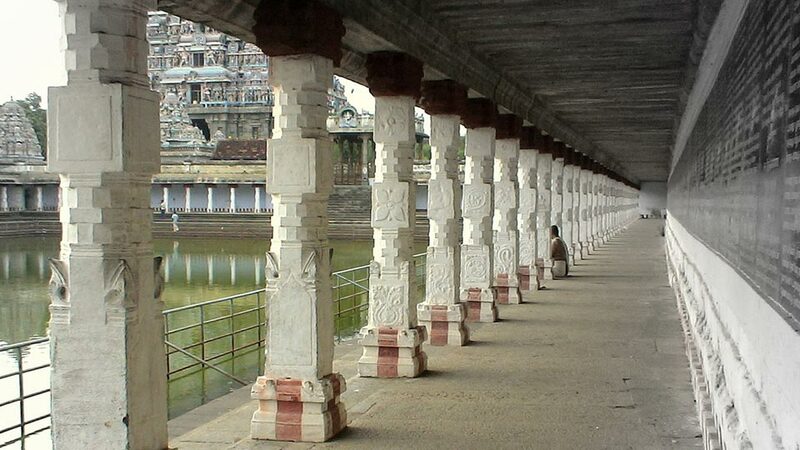 Chidambaram is also referred to in various works such as Thillai (after the Thillai forest of yore in which the temple is now located), Perumpatrapuliyur or Vyagrapuram் (in honour of Saint Vyagrapathar).The temple is supposed to be located at the Lotus heart of the Universe": Virat hridaya padma sthalam. On the spot where the Lord displayed his dance of bliss, the Änanda Thaandavam - a spot exactly south of the "Thirumoolataaneswar temple", today is the Ponnambalam/ Porsabai (Pon meaning gold, Ambalam/Sabai meaning stage) housing the Lord Shiva in his dancing form? The Lord is also hence referred to as the Sabhanayakar, meaning the Lord of the Stage. This gold-roofed stage is the sanctum sanctorum of the Chidambaram temple and houses the Lord in three forms: the "form" - the anthromorphological form as an appearance of Lord Nataraja, called the Sakala thirumeni. The "semi-form" – the semi-anthropomorphological form as the Crystal linga of Chandramouleswarar, the Sakala nishkala thirumeni. The "formless" – as the Space in Chidambara Rahasyam, an empty space within the sanctum sanctorum, the Nishkala thirumeni. By Air: Chidambaram does not have an airport. Nearest airport is Pondicherry Airport. By Rail: You can easily get regular trains to Chidambaram from other major cities of the country. By Road: There are regular buses from other major cities of the country to Chidambaram. The six abhishekas of sri Nataraja. Darshan= 6am to 12noon, 5pm to 10pm. Ardhaajaman= 9pm to 10pm (aprox).